The most commonly used chain extenders with 4,4’-diphenylmethyl diisocyanate (MDI) terminated prepolymers are 1,4-butanediol (BDO) and hydroquinone bis (2-hydroxyethyl) ether (HQEE). Compared to BDO as a chain extender, MDI-based polyurethane elastomers produced with HQEE have several distinct advantages. These include improved performance at elevated temperatures, higher hardness, increased tear strengths, and higher resilience. In addition, MDI/HQEE systems replicate many of the performance attributes of MOCA/TDI systems. Processors find that HQEE/MDI elastomers exhibit better high-temperature and moisture-resistance properties compared to TDI/MOCA elastomers. For this reason, MDI/HQEE systems are often recommended as alternatives to the TDI /MOCA systems. Sport and amusement park wheels. Despite HQEE’s variety of applications and advantage over BDO, processors still face difficulties with this chain extender. HQEE has a high melting point (>98 °C / 208 °F). HQEE does not supercool but will rapidly crystallize below its melting point. This requires heating melting tanks and all process lines to ~110 °C and insulating the lines to prevent clogging. In addition, choosing HQEE precludes the possibility of hand-batching. Furthermore, processors must preheat the prepolymer to around 100 °C before mixing it with HQEE. Otherwise, the HQEE will crystallize in the mix causing “starring” in the cured urethane elastomer. Any molds will also require preheating to above 110 °C. Many polyurethane processors continue to rely on HQEE without knowing that these difficulties can be significantly reduced by a lesser-known, but effective, chain extender—HER. An excellent alternative to HQEE is the hydroxyethylether of resorcinol or 1,3-Bis (2-hydroxyethyl) resorcinol (HER). An aromatic diol chain extender for polyurethane prepolymers, HER manifests good compatibility with MDI-based prepolymers and is used in cast polyurethane and TPU applications. Compared to HQEE, HER has a lower melting temperature (89 °C vs. 98-102 °C) and the ability to supercool, which significantly improves the overall ease of handling and processing. These characteristics of HER afford significant processing advantages, including a lower material processing temperature, which facilitates casting, coating, and molding operations, and provides greater processing latitude. HER’s lower melting temperature and supercooling characteristics enable MDI/HER polyurethane systems to be processed at lower temperatures and offer a longer pot life. The chemical structures shown below demonstrate the structural similarities between HER and HQEE. To more fully understand how the physical properties of these two molecular structures compare, see this comparison in the chart below. Even with the processing advantages of HER over HQEE, many organizations will desire data to compare the mechanical properties of these two chain extenders. However, the work of Klempner and Frisch provides comparative performance studies which demonstrate that HER and HQEE produce MDI polyurethane elastomers with similar properties. The following data is drawn from their work. 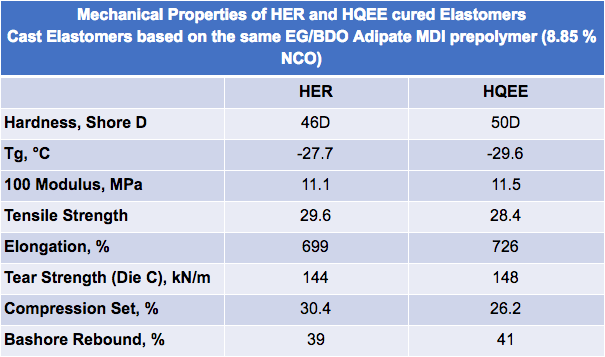 The chart below compares the basic physical properties of HER-cured elastomers vs. HQEE-cured elastomers in MDI systems. 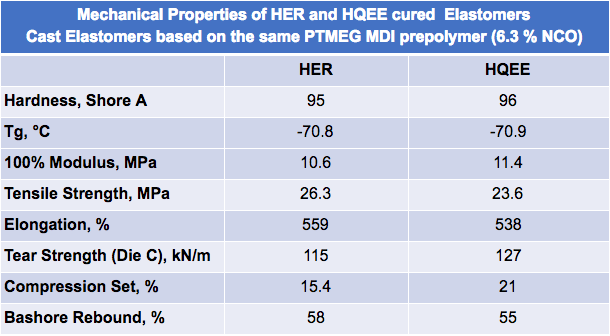 The data shows that HER- and HQEE-extended MDI elastomers have comparable properties in both polyether- and polyester-based MDI elastomers. With MDI prepolymers having NCO content greater than 6%, HER produces high hardness polyurethane elastomers due to the rigidity of the aromatic resorcinol moiety. Elastomers produced with HER generally have a slightly lower hardness, compared to HQEE-cured elastomers. Yet this hardness is higher than that achieved with conventional diol chain extenders such as 1,4-butanediol, diethylene glycol, and others. Although HQEE produces slightly higher hardness polyurethane elastomers compared to HER, in general, the physical properties and the performance of the materials made with these two diol curatives are similar. It’s important to note that the increase in hardness explains the attendant increase in tear strength and fracture energy of the polyurethane elastomer. Not only is HER a complete alternative for HQEE, but it can also function as a partial alternative for HQEE. Processors looking to significantly reduce the freezing temperature for processing can blend these two chain extenders together. Blending HER with HQEE to form a homogenous mixture, will result in a lower freezing temperature of the blend, compared to the freezing temperature of HQEE. As Klempner and Frisch explain, laboratory experiments have shown that a mixture of approximately 65% HER and 35% HQEE exhibits eutectic behavior. The result is a blend that solidifies at a temperature which is lower than the freezing temperature of any other composition of HER and HQEE. This composition is known as the eutectic composition, and the temperature at which it solidifies is referred to as the eutectic temperature of the mixture. The ability to drop the freezing temperature offers significant processing benefits and presents HER as a viable solution for some of the challenges associated with processing pure HQEE. Polyether MDI and polyester MDI cast polyurethane elastomers, using HER as the chain extender, exhibit comparable mechanical and physical properties as elastomers made with the same MDI prepolymers cured with HQEE. In addition to this benefit, HER eases the processing challenges associated with HQEE. Some of your cured products contain starring or defects due to HQEE’s processing characteristics. The ease of your operations could significantly improve from lower processing temperatures and an increased pot life. You’re searching for a chain extender mixture to lower the freezing temperature and improve handling and processing without a significant impact on the physical and mechanical properties of your elastomers. In cases like these, HER provides a viable alternative to HQEE. In addition to reducing the likelihood of solidification in the processing equipment or defects in the cured product, HER can increase pot life and offer a significantly lower freezing point when combined with HQEE. So you can experience the benefits of HER for your applications, Gantrade Corporation supplies HER in 20 kg and 25 kg carton drums with vacuum-sealed bags inside. Contact Gantrade for further technical, supply, and pricing information.